I've never been the type to spend lots of money on vacation souvenirs...... I'm kinda cheap like that. So this time, we decided to make our own souvenirs! I picked up a few stones from Ocean Beach and brought them home. We washed them and painted scenes from our vacation on them with acrylic paints, then labeled them on the back! It's a fun way to remember all the good times we had and the beautiful ocean! This one is supposed to be a peacock feather, if you can't tell... haha! I loved seeing the peacocks run wild at Irvine Park! They're gorgeous! Such a creative way to remember your vacation time. You are quite an artist. Your souvenirs turned out great. Clever idea. I was thinking I'd have all the rocks mixed up by the time I came home. I think I'd take a Sharpie along and label each one as I picked it up, and maybe a photo or two to document the spot. Sometimes the best souvenirs are things you don's usually consider souvenirs. I like to collect spices and herbs when I travel, so I have a taste of that city, sate or country for months to come (I vacuum seal them when I get home to make them last longer). Many years ago when I was a teen on vacation in Nice, I bought some yarn which I made into an afghan. It always reminds me of that trip. Mostly when I travel in Europe I am aghast at what things cost, and keenly aware that I can buy exactly the same products at home for less money. It's truly hard to find "real" souvenirs, but you've come up with a grand solution. I have discovered, though, in Europe you can find crafts stores that cater to tourists which feature local artisans at affordable prices (not unlike Ten Thousand Villages). For those of us not quite up to your painting abilities, local crafts make a nice souvenir and help the artists. Wow! What an awesome idea! Love these! OOO I love stones!so pretty painting! This is such a great idea! I love the beach rock. I may just have to do this with my girls. I would love for you to link this up to the challenge on my blog this week. The challenge is "Life at the Beach." This is perfect. It starts Wednesday night. Come on over! what a great idea! if I had artistic talent, I'd do that, too. Okay i'm so doing this! 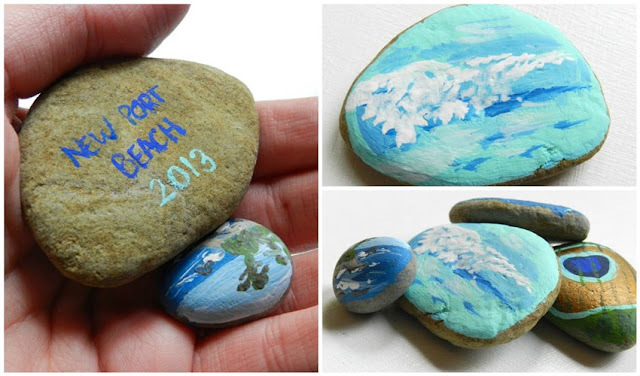 What a great idea to paint vacay memories onto the stones. Love this! Visiting from Tatertots and Jello. Neat idea and small enough to manage!